A SIGNIFICANT SIGNING – Kwanlin Dün First Nation Councillor Sean Smith signs the Memorandum of Understanding (MOU) while, left to right, Ta’an Kwäch’än Council Chief Katrina Kane, President of the AWG International Committe John Flynn, Council of Yukon First Nations Grand Chief Peter Johnston and President of the Whitehorse 2020 AWG Host Society George Arcand, look on, Saturday. The MOU is a commitment to meaningful engagement in the celebration of sport, culture, languages and traditions. On April 6, the International Day of Sport and Development and Peace (IDSDP), an annual celebration of the power of sport to drive social change, community development and to foster peace and understanding, a significant Memorandum of Understanding (MOU) was signed between Yukon First Nations and the Arctic Winter Games. 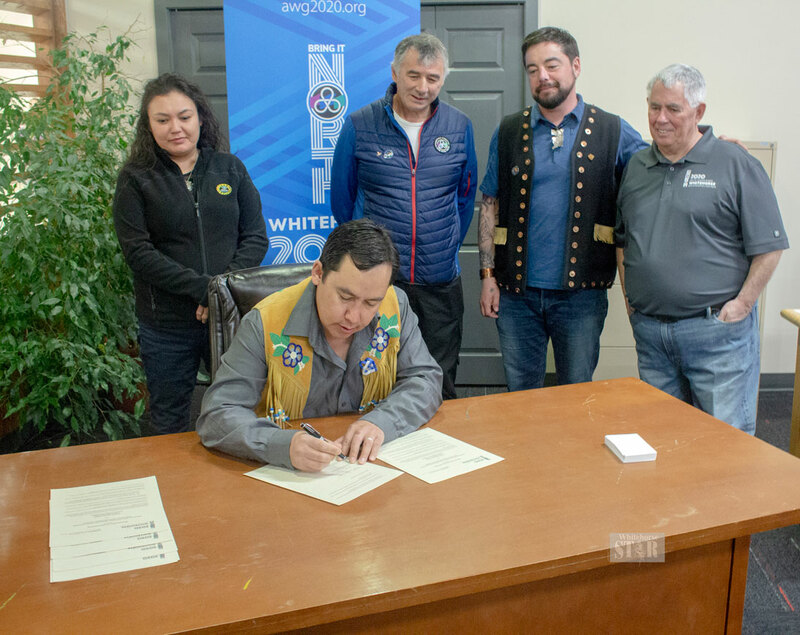 The Kwanlin Dün First Nation, Ta’an Kwäch’än Council, Council of Yukon First Nations, Arctic Winter Games (AWG) International Committee, and the Whitehorse 2020 Arctic Winter Games Host Society signed the MOU, committing to meaningful engagement in the celebration of sport, culture, languages, and traditions. The MOU aspires to: afford Yukon First Nations youth, elders and communities the opportunity to volunteer for the Games; recognize and celebrate Yukon First Nations languages, cultures and traditions; and create the opportunity for Yukon First Nations Elders to function as advisors for all youth at Games-time. Chief of the Ta’an Kwäch’än Council Kristina Kane said sport has always had an important role in First Nations history. “It’s really an honour and on behalf of the Ta’an Kwäch’än Council we are quite pleased to be a part of this,” said Kane. Councillor Sean Smith, of the Kwanlin Dün First Nation, said since it was the IDSDP it was a fitting day to sign the MOU. “Next year will be a wonderful boon for our community,” said Smith. Grand Chief of the Council of Yukon First Nations Peter Johnston spoke about the significance of the Games for everybody. As well, he spoke about how the First Nations can influence change in the Games. The Arctic Winter Games will begin next March and bring 2,000 athletes and volunteers to Whitehorse. The Games are also expected to bring over 3,000 visitors to the territory. Some benefits of the Games includes sport development throughout the North as well as Northern unity and cultural understanding. The IDSDP creates a historical link to the first modern Olympic Games in 1896, this day was declared by the United Nations(UN) General Assembly in 2013, and has been celebrated each year since 2014.